I like Black Currant Oil by NOW because it helps my hair and nails grow. I like the Black Currant Oil by NOW and use it for skin and nail health. 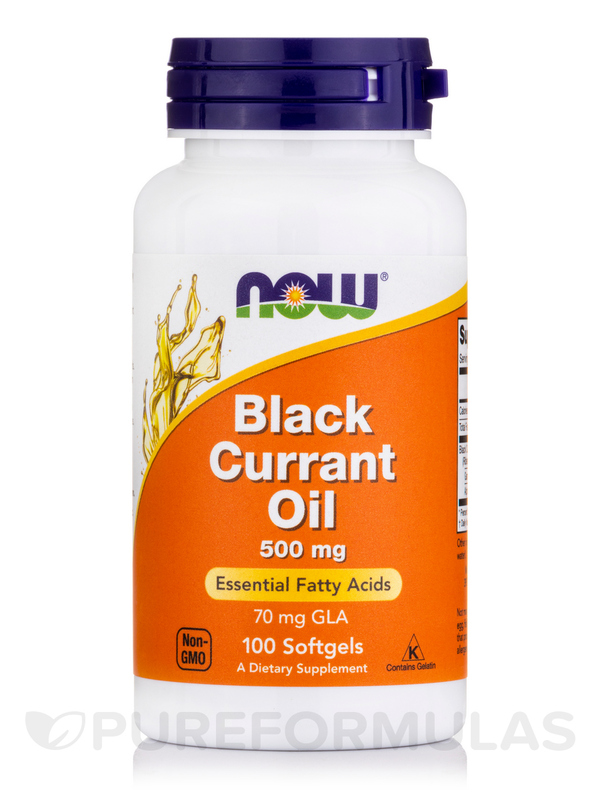 Black Currant Oil Softgels from Now® Foods contain essential fatty acids and chemicals that may help our immune health and reduce swelling. GLA (Gamma-linolenic acid)‚ the chemical that is predominant in this oil‚ may have a variety of health benefits. Used as a diuretic‚ this oil may also help in improving conditions of cold and fever. Herbal medicine believes that this oil may have beneficial properties to reduce menopausal symptoms and ease PMS. 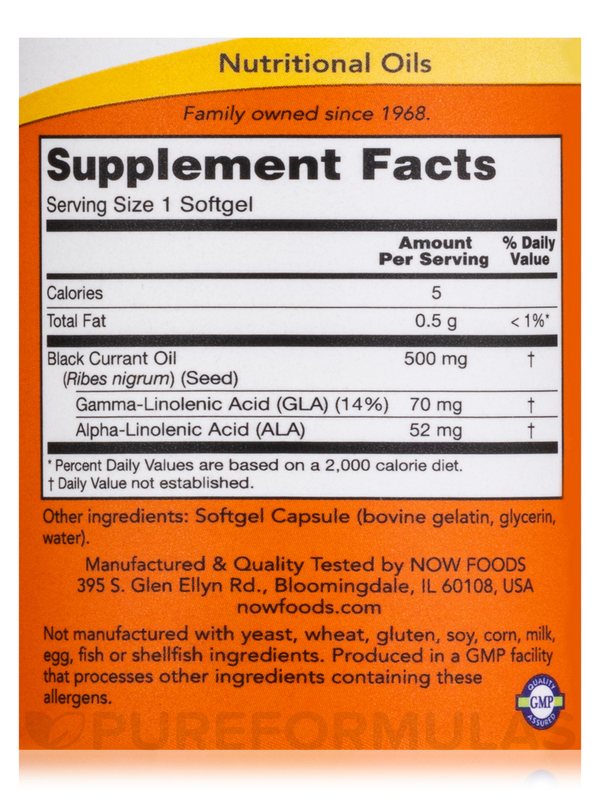 GLA present in this Now® Foods supplement is an Omega-6 fatty acid and is studied to reduce inflammation in the body. While it may also assist in reducing joint pains‚ it is said that this oil may have an important role to play as an anti-inflammatory agent. 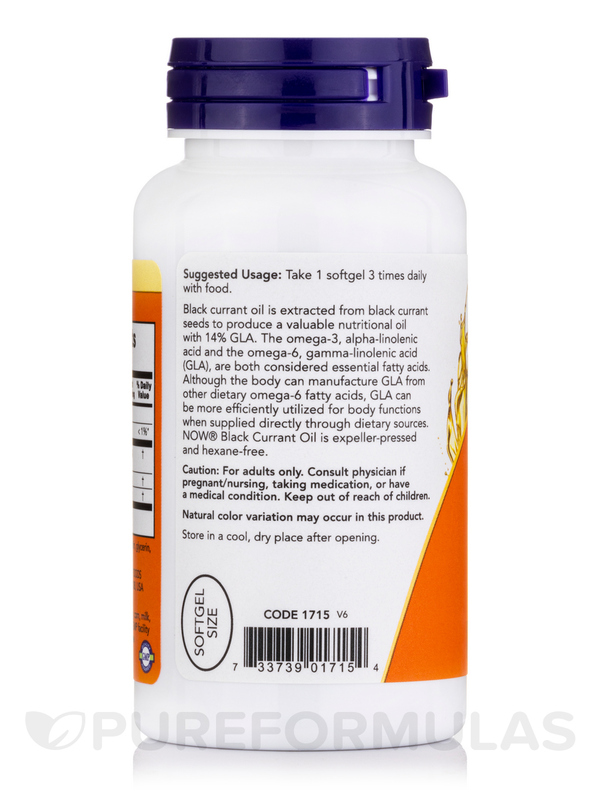 When taken regularly‚ this supplement could reduce the prostaglandin levels in older individuals. Prostaglandins are hormone-like substances that are responsible for inflammation and reduce the function of immune health. 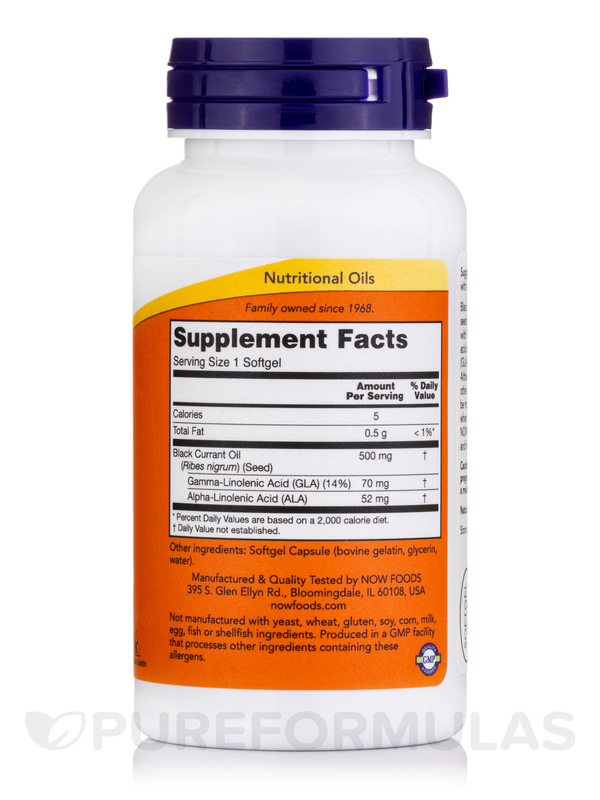 Give your health a boost when you use Black Currant Oil Softgels from Now® Foods regularly. After reading that taking Black Currrant Oil by NOW is recommended for weak and brittle nails, I decided to give them a try. I took two 500 mg softgels a day and within 3 months I had beautiful, strong nails. Amazing! I'm definitely a believer. I keep them in the fridge so the oil won't go rancid. Good price and I like the flip top bottle. My eye doctor told me to use Black Currant Oil 500 mg by NOW after my eye surgery for the trouble vision I was having due to the dry red eyes so I went to GNC and bought a bottle and he was right. It really help my vision and my hubbys. We take between 1 and 2 a day but the price was high there so I went to the NOW web site and the oil was almost half the price. If anyone has dry eyes after surgery and its hard to see they should really try the Black Currant Oil it works and it is worth the money. Wonderful experience and fast service, great product,what more could I want. Helps my hair and nails grow! Help hair and nails to grow! I like Black Currant Oil by NOW because it is an excellent source of GLA's which fight inflammation and have other benefits. NOW is a reputable company, too. 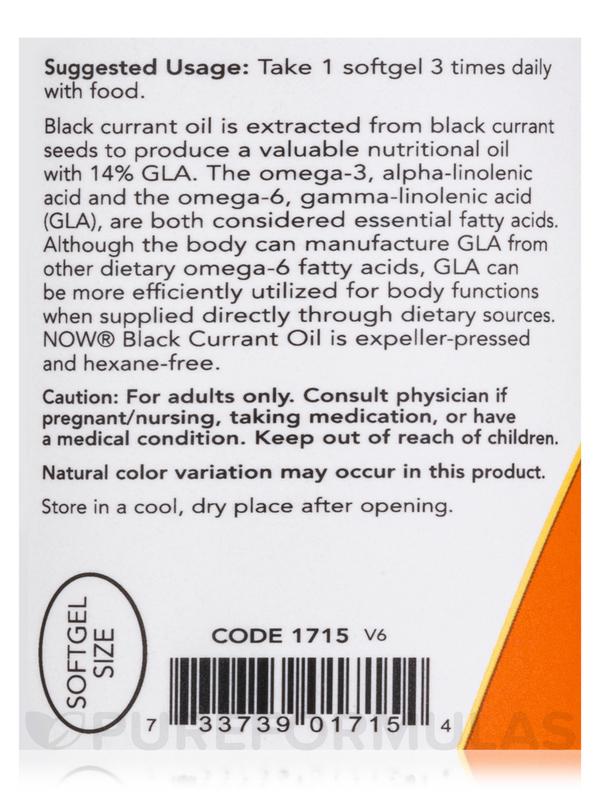 My doctor reccommended Black Currant Oil by NOW foods. My skin gets very dry in the winter and taking this daily really helps. Price and how it works for my skin. This helps keep them smooth, especially during the dry, winter months. I take this with ox bile for full absorption. I have been taking Black Currant seed oil for several years switching brands every now and then. I cannot say there is a difference between this one and other brands and am happy with the effects it has on the health of my skin (prone to dry skin) and especially my gums.